WASHINGTON -- The Federal Reserve ended weeks of speculation Thursday by keeping U.S. interest rates at record lows in the face of threats from a weak global economy, persistently low inflation and unstable financial markets. 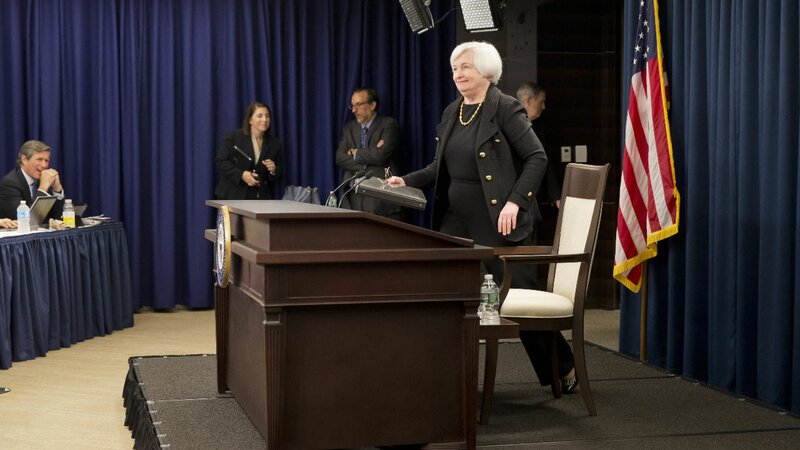 But at a news conference after a Fed policy meeting, Chair Janet Yellen said a rate hike was still likely this year. A majority of Fed officials on the committee that sets the federal funds rate - which controls the interest that banks charge each other - foresee higher rates before next year. The Fed will next meet in October and then in December. In maintaining its policy, the Fed is keeping its benchmark short-term rate near zero, where it's been since the depths of the 2008 financial crisis. A higher Fed rate would eventually send rates up on many consumer and business loans. The ultra-low loan rates the Fed engineered were intended to help the economy recover from the Great Recession. Since then, the economy has nearly fully recovered even as pressures from abroad appear to have grown. In a statement it issued after its meeting ended, the Fed said that while the U.S. job market is solid, global pressures may "restrain economic activity" and further slow inflation. Signs of a sharp slowdown in China, the world's second-largest economy, and other emerging economies have intensified fear about the U.S. and global economy. And low oil prices and a high-priced dollar have kept inflation undesirably low. "We're focused particularly on China and emerging markets," Yellen said at her news conference. "We've long expected, as most analysts have, to see some slowing in Chinese growth over time as they rebalance their economy. The question is whether or not there might be a risk of a more abrupt slowdown than most analysts expect." The continuation of the Fed's ultra-low-rate policy likely means that rates on mortgages and car loans will remain low. That could help maintain steady economic growth and hiring in coming months. Mark Vitner, an economist at Wells Fargo, said he was a bit disappointed by the Fed's delay because it suggested that the U.S. economy still wasn't at full health. But by holding down loan rates, the delay could lift home sales and construction, he said. More homebuilding, in particular, can help drive growth by creating construction jobs and boosting sales of furniture, appliances, electronic goods, and landscaping services. "That could allow the US economy to be in an even better place a few months from now," Vitner said. Other analysts worry, though, that ultra-low rates are encouraging more risk-taking by investors and could inflate bubbles in the stock market or other assets. Stocks ended mostly lower after a volatile day as traders tried to decide on the path of interest rates. The Dow Jones industrial average ended down 65 points, or 0.4 percent. It had rallied shortly after the Fed's statement came out, then drifted lower. But bond prices rose, sending yields lower, as traders reacted to the Fed's prediction that inflation will remain subdued. Financial markets had been zigzagging with anxiety this summer as investors tried to divine whether the Fed would start phasing out the period of extraordinarily low borrowing rates it launched at a time of crisis. At her news conference, Yellen stressed that even after the first increase from zero, interest rate policy will be "highly accommodative for quite some time." She has stressed that any rate increases will likely be modest and gradual. The Fed's action Thursday was approved on a 9-1 vote, with Jeffrey Lacker casting the first dissenting vote this year. Lacker, president of the Fed's Richmond regional bank, had pushed for the Fed to begin raising rates by moving the federal funds rate up by a quarter-point. The Fed's preferred measure of inflation was most recently up just 1.2 percent, compared with 12 months earlier. And it's been below 2 percent, year over year, for more than three years. The anxiety that gripped investors before Thursday's decision stemmed in part from concern that once the Fed starts raising its key rate, other rates - for mortgages, car loans, business borrowing - will eventually rise. Some fear the economy might suffer.